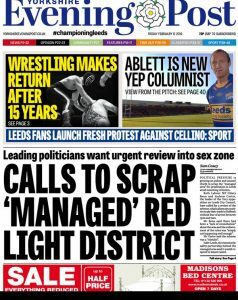 The scrutiny of the controversial ‘Managed Prostitution Area’ in Holbeck intensified this week – notably with significant new media coverage, and a heated meeting between businesses, West Yorkshire Police, the Council, and other stakeholders. Following local MP Hilary Benn’s article addressing the issue here in South Leeds Life last weekend, the Yorkshire Evening Post ran a front page splash on Friday (12 February 2016), and coverage from further afield included this article in the online magazine Vice. Also this week, over 30 businesses and organisations based in or around the zone had a stormy meeting with the Safer Leeds partnership – the body overseeing the scheme, made up of West Yorkshire Police, Leeds City Council, and other agencies – at the Civic Hall. Presentations by members of Safer Leeds – including Neil Evans (Director of Housing and Environment for Leeds City Council), and Superintendent Sam Millar – were followed by a long and at times difficult discussion, with many of the business owners and representatives angrily criticising the scheme, and its impact upon them, their businesses, and the area. Their concerns first centred around the lack of local consultation when the pilot scheme was first instated in 2014, then also the decision to extend it permanently last autumn. And there was also considerable criticism as to the perceived failure by the agencies to manage the scheme effectively. They insisted that the rules of the scheme were not being enforced, leading to an increase in prostitution, and it becoming more visible; that crime had increased, and that the streets were physically dirtier with the after-effects of the work (used condoms etc); and that they were losing business and staff members. There was also fear that property values were falling, and that redevelopment plans for the area were being set back. “I can’t disagree with the objections to the scheme as it stands: it’s evident that to date it’s been under-resourced and unsuccessful in many ways. But we may now have an opportunity to see real action. In particular, the Police now need to prove they can make this scheme work, and all eyes are on them to make sure it is. The Safer Leeds partners, especially West Yorkshire Police and the City Council, insist that they are listening to these and other complaints, and that more resources are being put towards the policing and enforcement of the scheme – starting this weekend. More street bins have been promised, more CCTV is being considered, and a new initiative – whereby local businesses and residents can become ‘Champions’ to help oversee the scheme – is in the pipeline. There is also a major residents meeting planned in the coming weeks, details for which are to announced shortly. The Labour regime have come up with some stupid ideas for Leeds in my lifetime but this takes the biscuit. Along with the career of Cllr Dobson. Just go. And don’t let the door hit you on the way out. As I said in my previous comment on Mr Benn’s article, invest time and money in this scheme and do it properly or don’t do it all. It would be a different story if prostitutes were soliciting on the Primley Parks in Alwoodley! !